The Jeppe Pipe Band is the oldest school pipe band in South Africa. The band won the South African Pipe Band Championships in 2014 and there has since seen a huge increase in membership, resulting in the band having to form two competition bands. Over the last few years, the band has become well-renowned in South Africa, as well as internationally. The band plays regularly at functions around South Africa, including weddings, funerals, birthday parties, and corporate functions. The band has played at several high-profile events over the past couple of years, including The Nedbank Golf Challenge and the Princess of Monaco’s Father’s 60th birthday celebration at Emperor’s Palace. 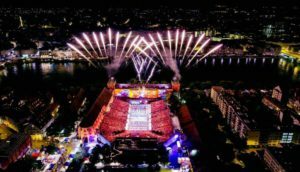 The highlight of 2016 was undoubtedly the much-anticipated overseas tour to Basel, Switzerland, to participate in the world-famous Basel Tattoo, second only to the Edinburgh Tattoo in terms of size and attendance. Our invitation was a rare honour, as we are only the second school band in history to take part in this prestigious event. Such was the interest in the band from Africa that Jeppe was the featured band leading up to the opening of the show. A video series called ‘The Road to Basel’ documented our preparations in the months leading up to the Tattoo. This exposure, together with the nightly sold-out shows of 10 000 people, and a street parade before 150 000 people, ensured that the Jeppe experience was shared with many thousands of people. The band members enjoyed a once in a lifetime experience, performing before a combined global audience of 400 000 people, while experiencing something of life in France, Germany and Switzerland. Jeppe has great pride in the Jeppe Pipe Band, and we anticipate decades of continued growth and success.